The world's oldest active biological society. 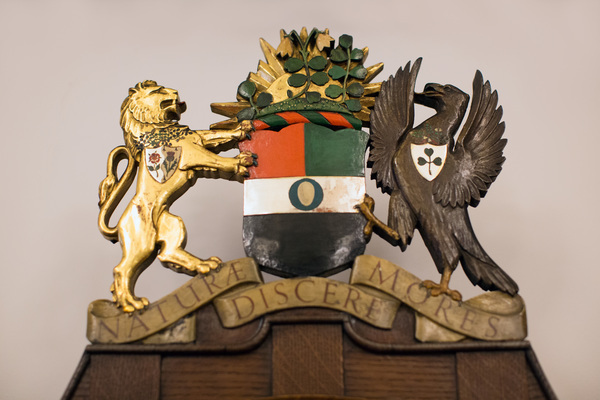 Founded in 1788, the Society takes its name from the Swedish naturalist Carl Linnaeus whose botanical, zoological and library collections have been in its keeping since 1829. The Linnean Society of London occupies a unique and prestigious location on Piccadilly, and is one of the five Learned Societies occupying the Courtyard of Burlington House. 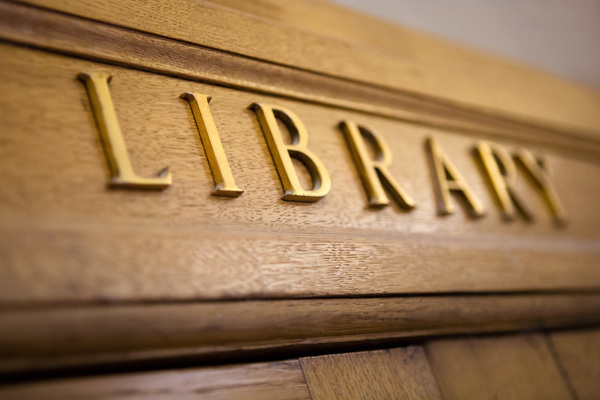 As well as providing a home for its natural history collections the Society hosts regular meetings with the majority of events open to the general public. The Linnaean Collections, including specimens of plants, fish, shells and insects as well as Linnaeus’ library and letters, are housed in a climate-controlled vault. In 1854 Burlington House and gardens were purchased by the Government. Burlington House was originally built for Lord Burlington by Sir James Denham. Richard Boyle, Earl of Burlington (1695-1753), put on a new south front and added an Italianate colonnade with archway entrance to the front courtyard. The House passed to the Duke of Devonshire in 1753 and he built the Burlington Arcade on adjacent land. In 1856 the Royal Society, the Chemical Society and the Linnean Society were permitted to occupy the rooms as a result of a Memorandum by Earl Rose, President of the Royal Society, recommending that the Government provide accommodation “under one roof” for the Learned Societies, this was supported by Prince Albert. In 1867 the Government leased the main building to the Royal Academy of Arts and allocated £20,000 for provision of new apartments for the Learned Societies in purpose-built wings around the courtyard. The architects for the Learned Society Rooms were Messrs. Banks and Barry, and the Linnean Society moved into its new rooms in 1873. The new rooms consisted of a Meeting Room on the ground floor, a Library and Council Room on the first floor, with accommodation for the Secretary in an apartment at the top, and rooms for a porter in the basement. The section immediately adjacent to the archway entrance was occupied by a post office until 1904, now only the wooden post box remains. In 1969 the building was redeveloped to incorporate a climate controlled vault for the Linnaean Collections, which still form the key source for identification of plants and animals worldwide. The changes also provided new office accommodation (using the old post office). 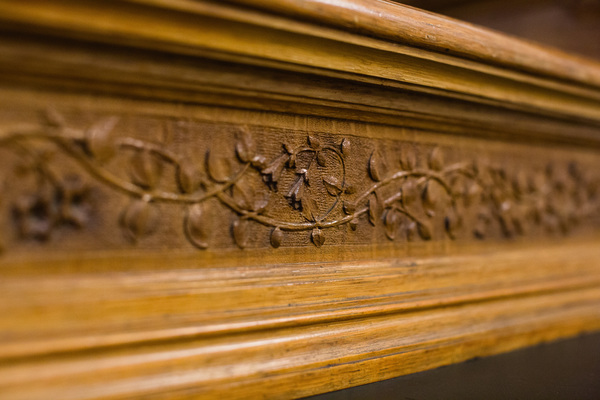 The Meeting Room, with an oak display bench engraved with Linnaeus’ signature flower Linnaea borealis, has retained its original character while providing modern audio-visual facilities. 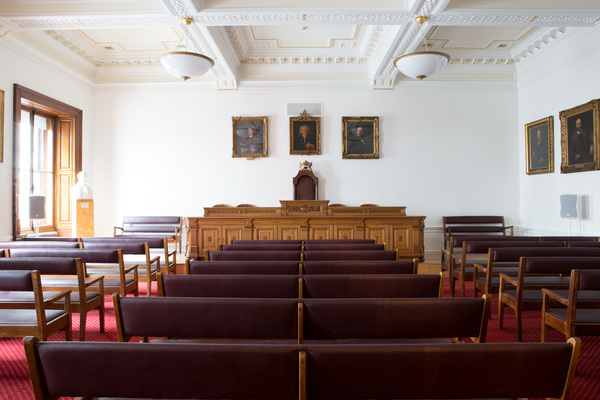 Refurbished in its original period style, the Meeting Room is in frequent use both for public lectures, conferences, and also used by a number of other organisations. Portraits include past Presidents and Vice-Presidents such as Robert Brown, George Bentham, Sir John Lubbock and Walter Percy Sladen. Particularly notable is the original painting of Charles Darwin by John Collier. It is now partnered by a specially commissioned posthumous portrait of Alfred Russel Wallace, co-discoverer of the theory of evolution by natural selection. 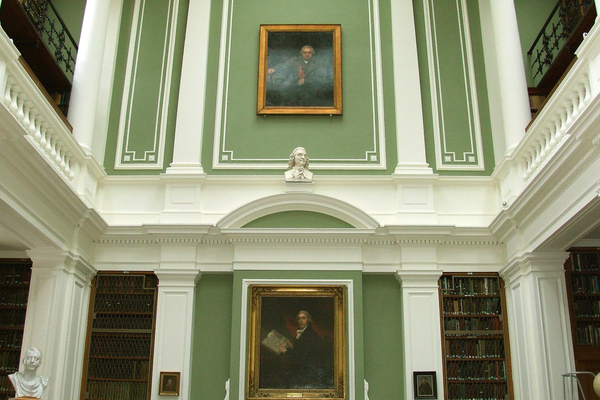 Papers by Darwin and Wallace were presented to the Society in its former accommodation in Burlington House. 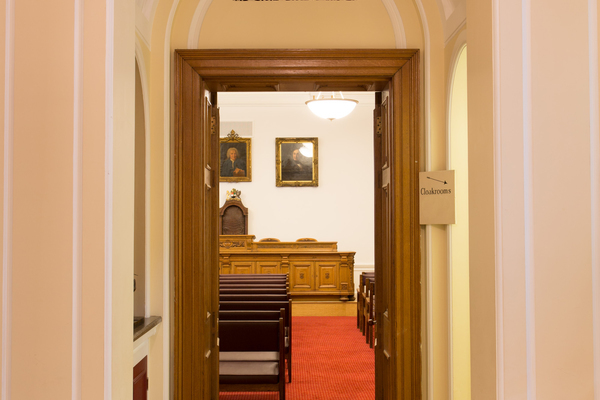 The room in which that meeting took place in 1858 has been renovated by the Royal Academy. 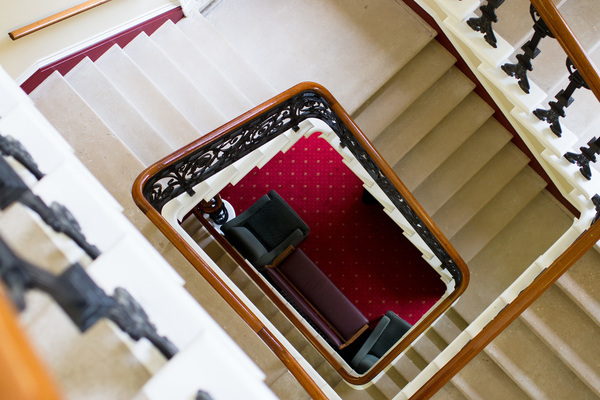 The main staircase has a selection of portraits, and leads to the Library on the first floor. This Library is in the form of a double cube with its classical pillars rising to the roof. These are not supported by any similar structures beneath, the weight of the books being carried on the walls. 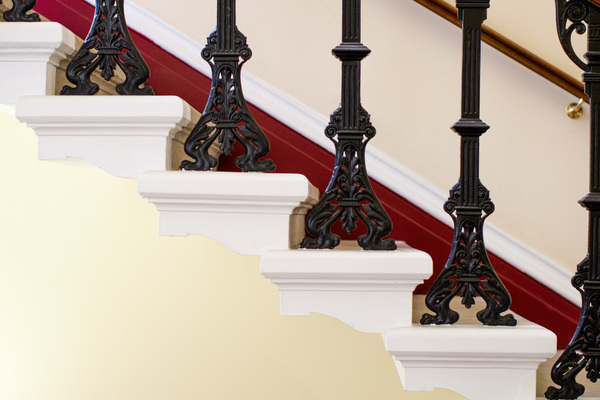 The height of the Library provides two galleries, the lower has a balustrade with bookcases behind, the upper footway is supported by cast iron brackets. The glass roof lights have been replaced with replicas of the original engraved glass panels. 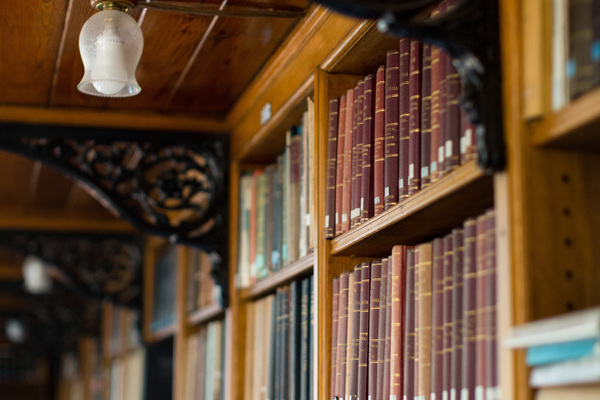 The Darwin-Wallace Collection, a series of books – donated by the Charles Darwin Trust – either written by or about Charles Darwin and Alfred Russel Wallace, is now installed in the new Discovery Room in the basement. Originally a store room for the library, this room was renovated in 2018 to become a new education space. 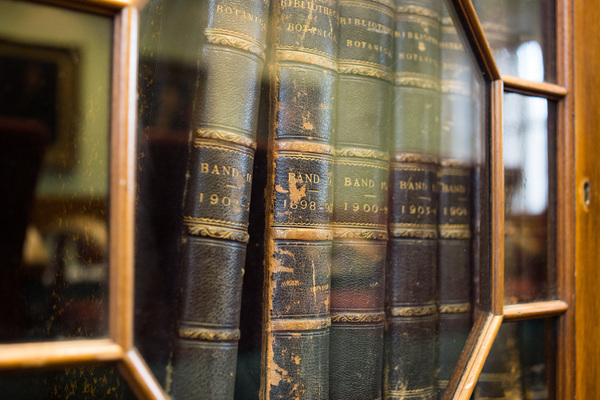 The display cases next to the Collection include a selection of specimens, books and manuscripts from the Linnaean Collections, and items which illustrate the history of the Society and its Fellows (including Brown’s microscope, the old ballot box, various manuscripts and books).